Marin County is the often forgotten area between San Francisco and the California wine countries of Napa and Sonoma. I have been here many times because I have family in this area, but this is the first time I’m getting to spend a week in this area exploring. My last trip here included a mini girls’ getaway with my nieces which was a lot of fun. This time it’s going to be a Napa getaway in Calistoga, but before that gets here I am checking out Marin, starting with Novato. According to Christine Bohlke, my contact from the Marin County Convention & Visitors Bureau, Novato is just the place for the Spirits Traveler to begin. You see, legend has it that a Russian contingency came here and was disappointed to find this area had “No Vodka,” and named the town accordingly! You won’t find a shortage of vodka – or any other spirits – here these days and Christine helped me prove that by taking me around town. 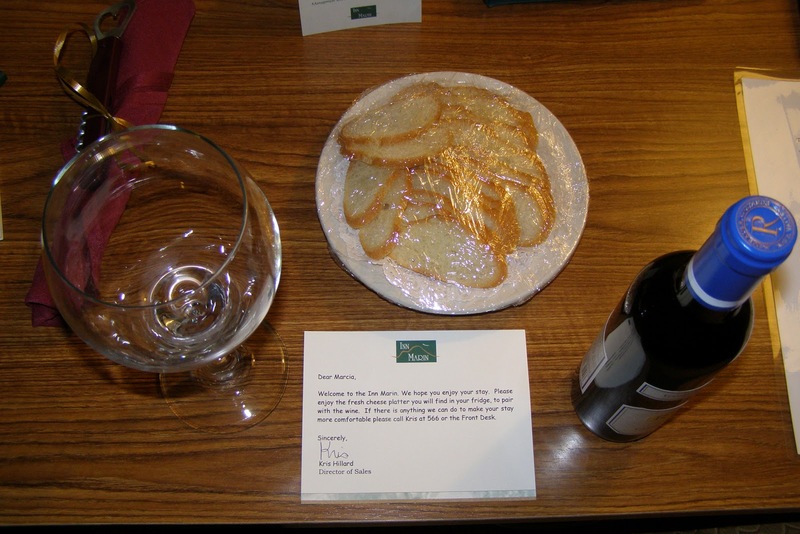 I had the pleasure of staying at one of the great representatives of Novato, the Inn Marin. This is a great place that has the casual comfort of a motel where you can park in front of your door, but the amenities of a resort, such as two-room mini suites, a pool and whirlpool; business center; exercise facility; and meeting rooms. 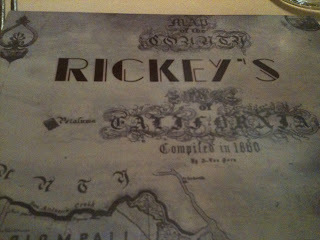 I also enjoyed the free wireless and continental breakfast in Rickey’s, where Christine and I were scheduled for dinner, but first we had someplace else to go. 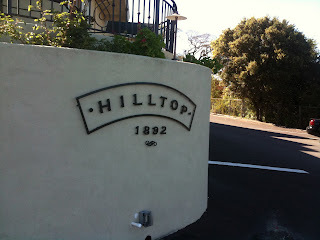 We started the evening off at a Novato place that has quite a history of its own. Hilltop 1892 has changed owners a number of times, but really did open in the late 19th century. More recently, it was purchased by Erick Hendricks, who remodeled both the décor and the menu, also bringing in mixologists Jhaun Paul DeVere to give a boost to the cocktail crowd. His motto is when it comes to drinks is ”Don’t try to reinvent the wheel. I just do the best job with the classics.” That he does, and he proved it by starting us with a Manhattan and a Sidecar. Christine and I talked about Marin, how each town has its own personality, while we sampled some more of John’s creations. Her favorite was the Orange Passion Fruit Mojito and I favored the Pomegranate Martini, which, like many of the drinks here, was served frozen. We also checked out some local wines and I would recommend the Hart’s Desire Sauvignon Blanc from Dry Creek Valley. After tasting some delicious appetizers of Truffle Fries and Wild Mushroom Bruschetta (and enjoying the wonderful views on a warm spring night), I finished off with a Bloody Mary, made with Effen’s Cucumber Vodka, before we headed back to Inn Marin, where the Kris Hillard, Director of Sales, was waiting for us at Rickey’s restaurant. 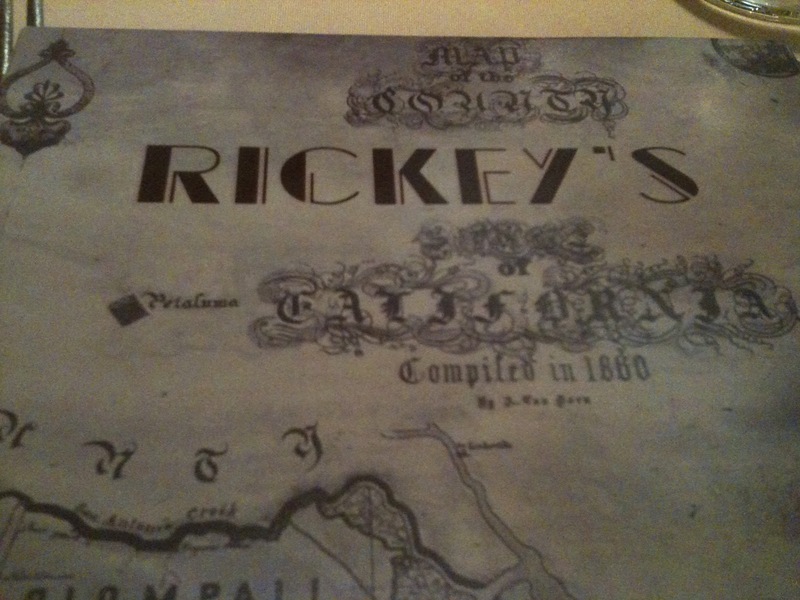 I have to say (even though I was just in Paris last week) that the meal at Rickey’s was one of the best I’ve had in a long time. I loved the varied menu, which seemed to cover everything from vegetarians to gluten intolerance to old fashioned meat and potatoes eaters. I started out with a scrumptious Chocolate Martini which was just sweet enough without making me feel like I was having dessert (they also have many other martinis on the menu). Chef Blake then brought us a perfectly grilled Polenta with Mushrooms, Onions and Garlic, along with a Crostilla that had grilled lamb. I had a tough time deciding on my dinner course, but settled on the Pork Loin which combined spicy chili and sweet apples and was great. I didn’t have to make a dessert decision as Rickey’s had a dream platter that seemed to consist of four of my favorites – Chocolate Lava Cake, Vanilla Crème Brulee, Ice Cream in a Berry Sauce and Coconut Flan. 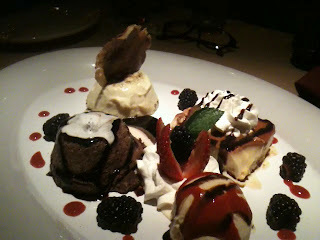 It was a perfect treat for the three of us, with enough to satisfy even four. 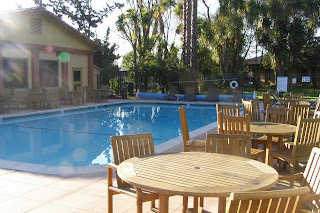 If you prefer, Rickey’s also offers has a Price Fixe dinner and has something really interesting in the summer – Dine & Dip, where you can bring the kids to swim while you enjoy Jazz, food and drinks. I’m off from the Inn Marin in Novato to check out another of the county’s gems, Larkspur, where I’m staying at the Courtyard Larkspur Landing. I’ll also be spending a bit of time with the family in Fairfax before the Calistoga getaway. Nice post. I'm glad you're enjoying our little slice of heaven here in Marin.